Jaime asked what inspired me to write Anathema and what inspires me to write in general. That’s a big question. I’ll try to answer it as best as I can. What inspired me to write Anathema? It’s pretty simple and not very poetic. Three months’ into a year-long maternity leave with my second daughter, I was having trouble thinking. I felt stupid. I couldn’t focus. I wasn’t using my brain and I was mentally tired because of it. This had happened to me during my leave with my first child as well. I knew it would be harder to shake the longer I let it go on. I needed to find a way to kick start things up there. In addition to my baby brain, I was facing considerable daily stress. My newborn had a temper and set of lungs to rival any banshee (she still does) and my older daughter was recently identified as a ‘special needs’ child - needs we are still learning about and certainly didn’t have a grasp of two years ago. For these reasons, I needed an escape. So I began thinking about writing a book. I’ve had my nose in books from a very young age and I always did well in my English classes. It sounded like a great challenge and way to keep my brain from going dormant. It was something I could take on while the kids napped and after they went to bed. So… I jumped in with both feet. I’m like that. I get an idea and I run with it. Anathema began with a very simple question: “What would happen if vampires took over the world?” I spent the next year- and- a- half answering it. Thank you to Two Chicks on Books for inviting me here today to talk about my new obsession. I hope your followers get a chance to read the outcome of my quest for sanity and fall in love with the worlds and characters I’ve created. Isn't Kathleen awesome? Ok so you all probably want contest details now right? Well here we go! 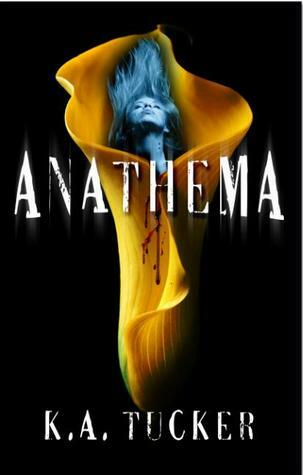 Kathleen is giving away a signed, print copy of Anathema to one lucky winner at the end of the blog tour. Anyone can enter by visiting her site at www.katuckerbooks.com (read giveaway rules posted). Do you want up to 10 extra chances to win? Visit each blog stop for an Anathema Quiz question. Answer it correctly and your name is entered! Simple! Here's your quiz question for today, Blog Stop #2: What thank-you gift does Sofie give to Evangeline for coming to NYC? Also Kathleen has given one e-book to give away on the blog! All you need to do is comment on this post to be entered and don't forget to leave your e-mail so we can contact you. We'll leave the contest open until midnight pacific time and as always we will draw names from a baseball hat because that's how we roll ;) Good luck! Nice post! KA Tucker is so sweet...huh?...As you would already know, don't sign me up for the giveaway! Sounds like an interesting read, I will have to add it to my 2011 reading list! Please don't enter me into the giveaway, I have thus book already. What an amazing journey! It's always great to hear how a story got started and what inspired it! @zw brown: It was very interesting and unique perspective on this subject manner.